WORKSHOP :: For Hand built bike wheels & all your cycling needs! 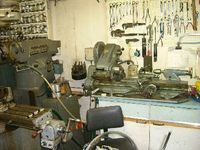 We have a fully equipped workshop (Containing many things, from a screw driver to a milling machine & lathe) and can draw on a depth of engineering knowledge, plus experience of wheel building and mechanical work on frames and bikes, both repair and manufacture. We are in the business of doing things properly but this doesn’t mean charging extortionate rates (However it doesn’t mean we are a charity either). Like our component prices, our labour rates are more than reasonable. We are not in the business of rectifying shoddy workmanship, on products bought elsewhere, that are still under warranty. When a bike is presented for service, in most cases, what they actually require is repair. Servicing is preventive process, whereby things are maintained before they go wrong. Repair is a remedial process, that is usually more costly than service. If quality bikes are serviced regularly and properly, they should give years of good service. Unless directed to a specific area, by the customer, when a bike is presented for a general service (Or repair as the case may be), it is subjected to a thorough check, according to a check list we have compiled. Provided a reasonable amount of work is then sanctioned, by the customer, this check is free of charge. If not a charge of £20 VAT is made. Reviewcentre.com contains reviews of cyclebasket.com, some of which cover things involving a labour content. Click here for details.